[ACT](VC):[Soul Blast (8) & Counter Blast (5)] Until end of the game, this unit gets [Critical]+1, and gets « [CONT](VC):This unit gets [Power]+1000 for each of your «Gold Paladin» rear-guards ». A heavy swordsman of the Gold Paladins’ Red Lion Corps, who wears body armor that gives off an aggressive silhouette. During the civil war, he was a member of the Shadow Paladins, and was saddened when their numbers lost their way due to the sealing of Blaster Dark, causing him to volunteer to join the Gold Paladin to find somewhere where he could fight more. He has no reverence for heroes, but he always appreciates someone with skill, and is more than willing to wait to cross swords with them. He continues to wander, looking for somewhere where he can swing his swords. Rather than being a lion, he might be a ferocious man-eating demon wearing the skin of a lion. is the name of one of the Gold Paladin corps, carrying the symbol of one of the seven sacred beasts that protects the Sanctuary. The Red Lion Corps heavily consists of soldiers who specialize in offensive assaults. Their number consists of the least amount of former knights, with most of the group being made of hooligans prone to doing whatever they want, but they are also the group, that out of all seven, has made the biggest gains. Those among the Red Lion Corps who were saved or defeated by Ezel, the current leader, found themselves attracted to him and joined in hopes of being assigned under him, resulting in a lord-and-retainer esque bond that is stronger than ones in the other corps. [ACT](RC):[Put this unit into your soul] Choose up to two of your rear-guards with « Jewel Knight » in its card name, and those units get [Power]+3000 until end of turn. One of the « Jewel Knights », the elite of the Royal Paladins. She possesses bright golden-yellow magical jewels. Although she’s the youngest « Jewel Knight » to currently be appointed, she’s incredibly proud of her brute strength that can put even giants to shame. But she’s always getting in trouble due to having a restless personality, making her a problem child for the higher ranking knights due to how bad she is, despite how strong she is. Because she gets a lecture from the other knights if she causes trouble, Tiffany is prone to running away and hiding until people lay off about it. Though, recently, high-ranking knights like Salome and Ashlei have joined in the search for her, resulting in her getting caught almost immediately, which leads to even more scolding. [AUTO](RC):[Counter Blast (1) & Put this unit into your soul] When an attack hits a vanguard during the battle that this unit boosted a unit with « Eradicator » in its card name, you may pay the cost. If you do, choose one of your opponent’s grade 1 or less rear-guards, and retire it. [AUTO](VC) Limit Break 4 (This ability is active if you have four or more damage):When you use a unit’s effect to send an opponent’s rear-guard to drop zone, during this turn, this unit gets [Power]+3000/[Critical]+1. [ACT](VC):[Counter Blast (2) – Cards with « Eradicator » in their card name] Your opponent chooses one of his or her rear-guards, and retires it. An « Eradicator » of Narukami with sharp horns shaped like thunder bolts who wears gigantic gauntlets. This savage form is not very off, as he’s the sort of guy who loves to show off his strength, a berserker with a war-like mouth and personality, hell, he used to be known as the « Wrecker » and « Prince of Destruction ». Those who receive the title « Eradicator » gain it for two reasons: Loyalty or Strength, he is unique in that he gained the title on the merits of strength alone. There are those who say brute force is not true strength. However, his insatiable desire for strength, causes him to show off incredible strength that surpasses any form of strength of will and spirit. Modification du 28 janvier 2013 : ajout des dates précises de sorties et de l’extra booster EB06. Voici également le planning des sorties japonaises jusqu’à cet été ! Here is our monthly maelstrom (no pun intended) of Cardfight News ! Enjoy ! And this month is fully made for the upcoming Booster Pack 10 : Triumphant Return of the King of Knights ! 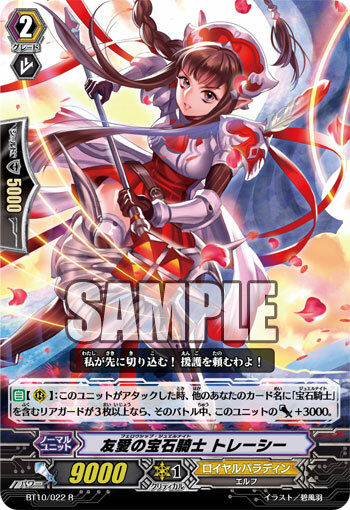 [AUTO](VC) Limit Break 4 (This ability is active if you have four or more damage):When this unit attacks a vanguard, if the number of other rear-guards you have with « Jewel Knight » in its card name is four or more, this unit gets [Power]+2000/[Critical]+1 until end of that battle. [ACT](VC):[Counter Blast (2) – Cards with « Jewel Knight » in their card name] Search from your deck for 1 Unit with « Jewel Knight » in its name, call it to a Rearguard Circle, then shuffle your Deck. [CONT](VC) Limit Break 4 (This ability is active if you have four or more damage):During your turn, this unit gets [Power]+2000 for each of your rear-guards with « Liberator » in its card name. [ACT](VC):[Counter Blast (2) – Cards with « Liberator » in their card name] Look at up to one card from the top of your deck, search for up to one «Gold Paladin» from among them, call it to an (RC), put the rest on the bottom of your deck. [AUTO]:[Choose a «Narukami» from your hand, and discard it] When this unit is placed on (GC), you may pay the cost. If you do, choose one of your «Narukami» that is being attacked, and that unit cannot be hit until end of that battle. [AUTO](VC/RC):[Counter Blast (1) – Cards with « Liberator » their name] When this unit’s attack hits a vanguard, if you have a «Gold Paladin» vanguard, you may pay the cost, and if you do, look at the top card of your deck, search for up to one «Gold Paladin» from among them, call it to an open (RC), and put the rest on the bottom of your deck. [CONT](VC):If you have a card named « Twilight Hunter, Artemis » in your soul, this unit gets [Power]+1000. Auto (V/R): [Counterblast (2)] When this Unit’s attack hits, if you have a <> Vanguard, you can pay the cost. If you do, draw 1 card. [AUTO]:[Choose a «Genesis» from your hand, and discard it] When this unit is placed on (GC), you may pay the cost. If you do, choose one of your «Genesis» that is being attacked, and that unit cannot be hit until end of that battle. 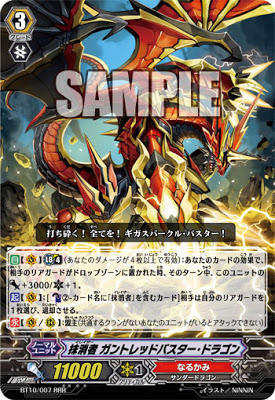 [AUTO](RC):When this unit attacks a vanguard, if you have a «Spike Brothers» vanguard, this unit gets [Power]+2000 until end of that battle. Auto (VC/RC): [Counterblast (2) « Spike Brothers « ] When this Unit attacks, if you have a « Spike Brothers Vanguard, you can pay the cost. If you do, this unit gains 4000 Power during this battle. Auto: (VC) Limit Break 4 (This ability is active if you have four or more damage): When this Unit attacks the Vanguard, this card gains 5000 power during that battle. 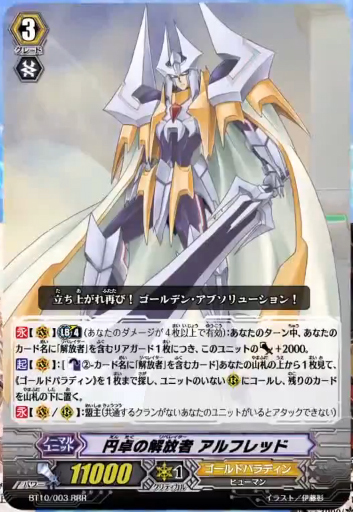 Auto [RC]: When this Unit attacks the Vanguard, if you have a « Royal Paladin » Vanguard, this Unit gains 2000 Power during this battle. Auto (V/R): When this unit attacks, if you have a Royal Vanguard with LB4, this Unit gains 3000 Power during this battle. [AUTO]:[Choose a card from your hand, and discard it] When this unit is placed on (RC), if the number of rear-guards you have with « Jewel Knight » in its card name is three or more, you may pay the cost. If you do, draw a card. 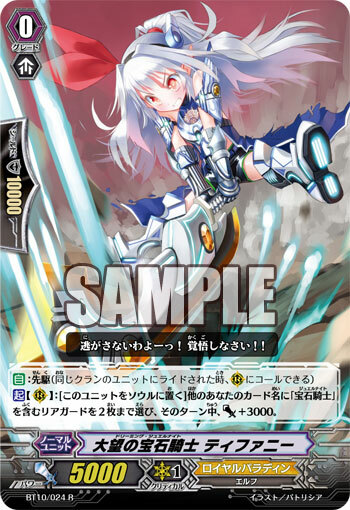 [AUTO](RC):When this unit attacks a vanguard, if you have a «Genesis» vanguard, this unit gets [Power]+2000 until end of that battle. [CONT](VC): If you have a card named « Bowstring of Heaven and Earth, Artemis » in your soul, this unit gets power +1000. [AUTO](VC): When this unit’s attack hits a vanguard, Soul Charge (2), and if you have « Bowstring of Heaven and Earth, Artemis » in your soul, Soul Charge (2). [AUTO](VC/RC):[Counter Blast(1)] When this unit’s attack hits a vanguard, if you have a «Genesis» vanguard, you may pay the cost. If you do, Soul Charge(3). [AUTO](RC):[Counter Blast(2)] When this unit boosts a «Genesis» unit, and the attack hits a vanguard, you may pay the cost. If you do, Soul Charge(3). [AUTO]: When a unit named « Bowstring of Heaven and Earth, Artemis » rides this unit, look at up to 7 cards from the top of your deck, search for a « Twilight Hunter, Artemis » or « Battle Deity of the Moonlit Night, Artemis » from among them, reveal it to your opponent, add it to your hand, and shuffle your deck. [AUTO](VC) Limit Break 4 (This ability is active if you have 4 or more damage): When this unit attacks a Vanguard, this unit gets power +5000 until end of that battle. [AUTO](RC): When this unit attacks a vanguard, if you have a «Nova Grappler» vanguard, this unit gets power +2000 until end of the battle. Auto (RC): When this Unit Attacks, if you have a « Beast Deity » Vanguard, this unit gains 3000 Power during this Battle. 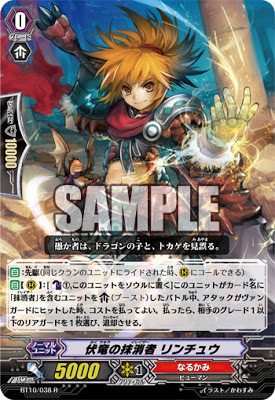 Auto (VC/RC): [Counterblast (2) « Narukami »] When this Unit attacks, if you have a « Narukami » Vanguard, you can pay the cost. If you do, this unit gains 4000 Power during this battle. Auto [R]: [Counterblast (1) & Put this unit into your soul] During the battle when this unit boost a unit with « Eradicator » in their card name, if the attack hits a vanguard, you may pay the cost. If you do, choose one opponent’s grade 1 or less rear-guard, and retire it. 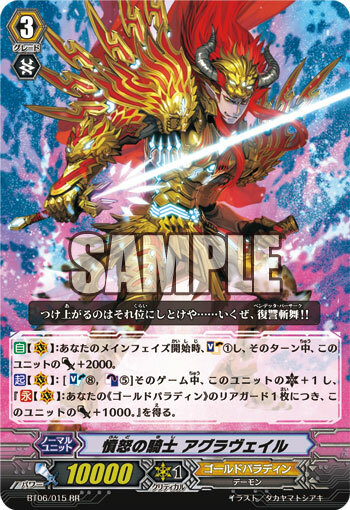 [AUTO]:When this unit is placed on a (RC) from the deck, if you have a «Gold Paladin» vanguard, choose up to one card on your damage zone, turn it face up, and Soul Charge (1). AUTO: [Soul Blast (1) – Liberator card] When this Unit appears in the Rearguard Circle from the Deck,if you have a « Liberator » Vangurd, you can pay the cost. If you do, draw 1 card. [AUTO](RC):[Put this unit into your soul] When an attack hits during the battle that this unit boosts a card with « Liberator » in its card name, you may pay the cost. If you do, choose one card named « Blaster Blade Liberator » in your soul, and call it to an open (RC). [AUTO](RC):When a grade 3 «Gold Paladin» is placed on your (VC), this unit gets [Power]+10000 until the end of turn. Auto (VC/RC): [Counterblast (2) « Gold Paladin »] When this Unit attacks, if you have a « Gold Paladin » Vanguard, you can pay the cost. If you do, this unit gains 4000 Power during this battle. Auto [R]: [Soul Blast (1)] When this unit boosts「Liberator of Round Table, Alfred」, you may pay the cost. If you do, the boosted unit gets [Power]+5000 until end of that battle. Auto (RC) : [Counterblast (1)] When this Unit boosts a « Gold Paladin » Unit that possess « Limit Break 4 », you can pay the cost. If you do, the boosted Unit gains +3000 Power. Auto (RC): [Move this unit into Soul] When this unit boosts a [Limit Break 4] « Gold Paladin » Vanguard, and the boosted unit hits, you may pay the cost. Draw one card. [AUTO](RC):When a grade 3 «Royal Paladin» is placed on your (VC), this unit gets [Power]+10000 until the end of turn. [AUTO](VC/RC): [Counterblast (1) – Royal Paladin card] When this Unit attacks, if you have a Royal Vanguard, pay the cost. If you do, this Unit gains +4000 Power this Battle. Auto (RC): [Move this unit into Soul] When this unit boosts a [Limit Break 4] « Royal Paladin », and the boosted unit hits the Vanguard, you may pay the cost. Draw one card. Auto (RC): [Soul Blast(2)] When this unit hits the Vanguard, and you have a « Spike Brothers » Vanguard, you may pay the cost. Choose one of your opponent’s Rearguard, and retire it. Then, return this unit to the deck and shuffle it. Auto (RC) : [Counterblast (1)] When this Unit boosts a « Spike Brothers » Unit that possess « Limit Break 4 », you can pay the cost. If you do, the boosted Unit gains +3000 Power. Auto (R): When this Unit boosts a « Spike Brothers » Normal Unit Rearguard, that Unit can gain an additional 3000 Power during this Battle. If it gains that additional 3000 Power, when this Battle Ends, place this Unit at the bottom of your Deck. Auto (RC): [Move this unit into Soul] When this unit boosts a [Limit Break 4] « Spike Brothers », and the boosted unit hits the Vanguard, you may pay the cost. Draw one card. Auto (V/R): [Counterblast (2) « Genesis » cards] When this Unit attacks, if you have a « Genesis » Vanguard, you can pay the cost. If you do, this Unit gains 4000 Power during this Battle. [CONT](VC):If you have a card named « Glittering Star Night, Artemis » in your soul, this unit gets [Power]+1000. [AUTO]:When a «Genesis» other than a card named « Twilight Hunter, Artemis » rides this unit, look at seven cards from the top of your deck, search for up to one card named « Twilight Hunter, Artemis » from among them, ride it, and shuffle your deck. [AUTO]:When this unit is placed on (VC) or (RC), if you have a «Genesis» vanguard, you may Soul Charge (1). Activate (R): [Counterblast (2)] During a Battle in which this Unit boosts a « Genesis », when that attack hits the Vanguard, you can pay the cost. If you do, Soul Charge (3). Auto (RC): [Move this unit into Soul] When this unit boosts a [Limit Break 4] « Genesis », and the boosted unit hits the Vanguard, you may pay the cost. Draw one card. [AUTO](RC):When a grade 3 «Nova Grappler» is placed on your (VC), this unit gets [Power]+10000 until the end of turn. Auto (VC/RC): If you have a Beast Deity Vanguard, and this card’s attack hits the Vanguard, you can discard 1 card to draw 1 card. Auto (RC): When another rear-guard on the same column as this unit stands, stand this unit. Auto (VC/RC): When an opponent’s Unit is retiered to the Drop Zone and you have a « Eradicator » Vanguard, this Unit gains 3000 Power during this turn. Auto: [Counterblast (1)] When this Unit appears in a Rearguard Circle, if you have a « Narukami » Vanguard, you can pay the cost. If you do, select 1 of your opponent’s Rearguards in the Front Row, retire it, and then your opponent draws 1 card. AUTO: When this unit is placed on Rear-guard Circle, choose another of your «Narukami», and that unit gets Power +2000 until end of turn. [AUTO](VC/RC):When this unit attacks, if the number of rear-guards you have is less than your opponent’s, this unit gets [Power]+3000 until end of that battle. [BT10] Alfred is back ! The day before the KeroKero Ace, Alfred is revealed to us ! [CONT](VC) Limit Break 4 (This ability is active if you have four or more damage):During your turn, for each of your units with « Liberator » in its name, this unit gets [Power]+2000. [ACT](VC):[Counter Blast (2) – cards with « Liberator » in their names] Look at up to 3 from the top of your deck, search for up to one «Gold Paladin» from among them, call it to an (RC), put the rest on the bottom of your Deck. Auto (RC): When this unit attacks, and if you have 3 or more other Rearguards with « Jewel Knight » in its name, during this battle, this unit gets Power +3000. The older sister of « Sherry », she is one of the « Jewel Knights », the elite of the « Royal Paladins ». She possesses red magical jewels. She always stands at the front lines, even volunteering to cover for retreating soldiers in case of a pull back, she is famous for « Thinking about her friends » since she’ll always help a friend, even if it means putting herself in danger. However, in contrast for her compassion to her friends, she never forgives or holds back for an enemy. All enemies before her are treated simply as obstacles, who she’ll instantly cut down with her halberd should they stand in her way. She never forgives anyone who intends to hurt any of her precious friends and comrades. As some of you may know, a Tome 0 for the manga series is coming out in Japan as I speak. 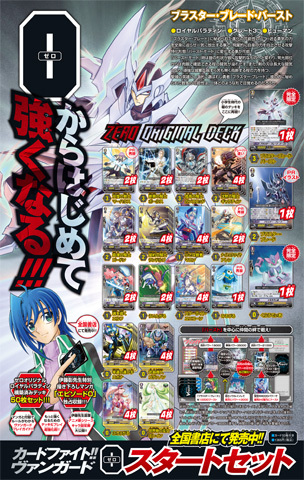 Maybe you wondered about the recent Blaster Blade Burst and Kurodia in the Promo Cards section… It is the Promo Trial Deck along with it ! Comme certains d’entre vous peuvent le savoir, un Tome 0 du manga est paru au Japon tandis que je vous parle. Peut-être avez-vous remarqué les Blaster Blade Burst & Kurodia dans la section Promo Cards… Ils font partie de ce Promo Trial Deck !